Condo, 2 Bedrooms, 2 Baths, 6 Sleeps, full kitchen, linens, pool and ocean. south of Cocoa Beach. Private relaxing Couple's vacation spot, as well as very Family friendly. Beautiful sunrises. Screened-in balcony. Lots of wide sandy beaches to walk and play on. Shopping minutes away. Many restaurants and activities nearby and north at Cocoa Beach, Kennedy Space Center, Port Canaveral, and south at Indiatlantic and Melbourne Beach. Orlando airport and activities only 50 minutes away. Hair blow dryers available. Toilet paper, bath soaps, hand soap, tissues, towels, hand towels, wash cloths available. Bring own shampoo. Bring own sunscreen. Coin operated, one available on each floor for guest use. Bring quarters...$1.50 a load. Coin operated, one available on each floor for guest use. Bring quarters...$1.75 washer, $1.75 dryer. Available outside only. Do not park in marked spaces under cover outside. Wi-Fi password available in condo. 48" TV, cable tv, DVD player available. Recently remodeled: new dbl sink, counter tops, and microwave. Opened up some wall for more ocean view. Table with 2 padded benches. 48" in Living Room, 40" in Master bedroom, 32" in Guest bedroom. Blu Ray DVD player available in Living room. Ping Pong table, some card game tables, and tv available in 1st floor game room. Some videos available in condo. Condo has screened-in balcony with high table and 2 high chairs, 2 gliding chairs and small table. Lounge and beach chairs available outside on sundeck overlooking ocean. Shuffleboard court available outside. Condo pool available. Lounge chairs available for around pool and on sundeck overlooking ocean. A few umbrella covered tables. Bring condo beach towels to pool. No condo lounge chairs to the beach. Tile floors in all rooms except bedrooms. Bedrooms, recently (Nov 2018) replaced carpet with laminate wood look plank flooring. King-size bed in master bedroom and in guest bedroom. Air conditioning, cable TV in living room and both bedrooms, DVD and VCR in Liv Rm. Highspeed internet included. Password provided in condo. Telephones available for 911 use only. 48' flat screen TV in living room and 40" flatscreen TV in master bedroom, 32" in Guest bedroom. Fully stocked kitchen, linens, beach towels. Grocery and other shopping just minutes away. Breakfast, lunch and dinner restaurants across the street, and many others nearby. Soda/ice/etc. available across the street at convenience mart/gas station. Safe, keyed-entry condo building. Well lighted and clean. Coin-operated laundry facilities on each floor, bring quarters, $3.50 per wash+dry. 50 minutes from Orlando airport and fifteen minutes from Melbourne Airport. No Smoking and No pets. Loved staying in this condo. Everything was fresh and clean and whatever you needed was at your fingertips. Had ocean views from all windows and the ocean front balcony views were so beautiful and peaceful. Will be staying in this unit again in the future. The condo was very well supplied. The furnishings were very comfortable, decor bright and cheery and the view was exceptional. Sunrises from the balcony were worth getting up early for. The condo was well priced for the location with everything you needed within a 5 to 10 min drive. Highly recommend this place. First thing we noticed when we arrived was the cleanliness. This condo is very well maintained and had everything we needed for a nice stay. The ocean feels like right up the balcony (which is enclosed with screen), the view is stunning, beds are comfortable, the area is quiet, and the whole Satellite beach is one of the safest around. Stores and restaurants are within a short distance, convenience store right across the street should you need something right away. We enjoyed having two full baths and plenty of towels. Steve is just a phone call or an email away, residents are friendly - we felt welcome. Overall, it was a great experience, I highly recommend this place, and I will be coming again. Thank you! We were here the first week of June 2018. This was our 2nd time staying in this condo. Our 1st time was in October 2017. We enjoyed it so much we couldn’t wait to come back. The condo is stocked with everything a family needs to feel at home. The view from the 2nd floor balcony is incredible! We felt like we were right on the beach. There is nothing like sitting outside on the balcony watching and hearing the waves roll in. It is so peaceful and relaxing! We will be back again and again! Really loved the condo and the rooms. It was very comfortable and right on the beach, you can’t get any closer than this! I would recommend This condo to everyone wanting a great vacation. The condo was stocked with all the main essentials. I would stay here again!!! 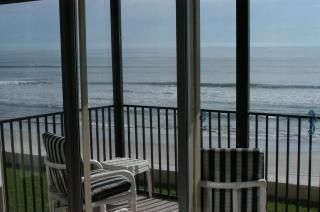 Steve's condo has everything you could ask for in a rental....PLUS an ocean view that can't be described in words! If you want a little piece of heaven vacation here!! Unlimited beach walking both north and south of condo. Ocean and nearby river fishing available. On-site shuffleboard, ping-pong and game room. 60 minutes from Disney World and other attractions. air boat rides, manatee and dolphin siting tours, put-put golf, movie theaters, etc., just a short drive away north or south of condo on A1A.